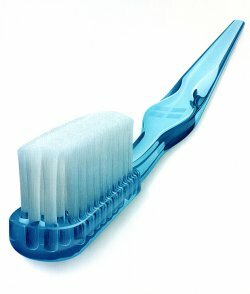 Community Blog - What’s on the End of Your Toothbrush? What’s on the End of Your Toothbrush? The thin membrane on the wall of the mouth absorbs that which touches it, as does the tongue. This is how mainstream toothpaste, loaded with chemicals can harm your health. You can't currently find toothpaste that is 100% organic. The main ingredient chalk, is a naturally occurring product of nature and cannot be cultivated by man thus will not be certified organic by the certification bodies. Foaming agent SLS - an unnecessary ingredient in toothpaste, can cause severe skin and mouth irritation. If you suffer from mouth ulcers, cutting out SLS laden toothpastes can often be a huge help. Fluoride* - If ingested fluoride can cause nausea, vomiting, fluorosis and osteoporosis. According to the Fluoride Action Network, the average tube of Colgate for Kids toothpaste contains enough fluoride to kill a small child. The US Food and Drug Administration ensure all toothpaste labels have a poison warning and emergency number in case swallowed. Sodium Hydroxide is used as a whitener for teeth but also as a bleaching agent for household cleaning products. Artificial sweeteners (saccharin) and colours are potential cancer causing ingredients, as is carrageenan, which is used to thicken toothpaste. The antibacterial agent triclosan is added to toothpaste to reduce plaque but can also cause ulcers and allergic reactions. If you would like to avoid these ingredients, then the best option is to switch to a natural toothpaste. At So Organic we have a wide range to choose from which all avoid the ingredients mentioned above. One notable exception is fluoride*, because although it can be potentially harmful if swallowed, it does also have the ability to help remineralise the teeth and make them stronger which is why your dentist will recommend that you use a fluoride toothpaste. We therefore stock a few toothpastes with fluoride for those customers that want it, but lots without it too. We label them clearly so that it's easy to tell the difference and make your selection. If you need any advice or help choosing please don't hesitate to get in touch or call us on 020 8465 5600, our specialists use all the products themselves and are always happy to help.